, a very learned Spanish Jesuit, was born at Fuente del Maestro, a small village in the province of Estramadura, in 1534. He studied under Dominicus Asoto, a Dominican, and also under Francis Tolet, a Jesuit, who was afterwards a cardinal, and there was no better scholar in the university of Salamanca in his time, than Maldonat. He there taught philosophy, divinity, and the Greek language. He entered into the society of the Jesuits, but did not put on the habit of his order till 1562, when he was at Rome. In 1563, he was sent by his superiors to Paris, to teach philosophy in the college which the Jesuits had just established in that city; where, as the historians of his society tell us, he was so crowded with hearers, that he was frequently obliged to read his lectures in the court or the street, the hall not being sufficient to contain them. 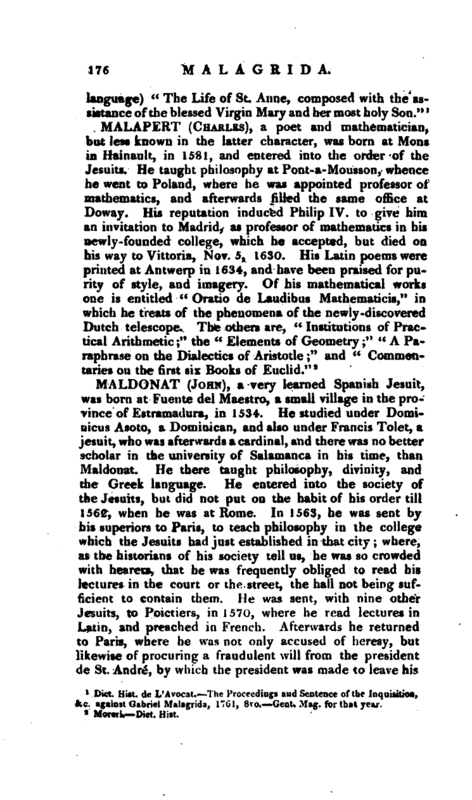 He was sent, with nine other Jesuits, to Poictiers, in 1570, where he read lectures in Latin, and preached in French. Afterwards he returned to Paris, where he was not only accused of heresy, but likewise of procuring a fraudulent will from the president de St. Andre, by which the president was made to leave his | estate to the Jesuits. But the parliament declared him innocent of the forgery, and Gondi, bishop of Paris, entirely acquitted him of the charge of heresy. He afterwards thought proper to retire to Bourges, where the Jesuits had a college, and continued there about a year and a half. Then he went to Rome, by the order of pope Gregory XIII. to superintend the publication of the “Septuagint‘? and after finishing his” Commentary upon the Gospels," in 1582, he died there, in the beginning of 1583. He composed several works, which shew great parts and learning; but published nothing in his life-time. 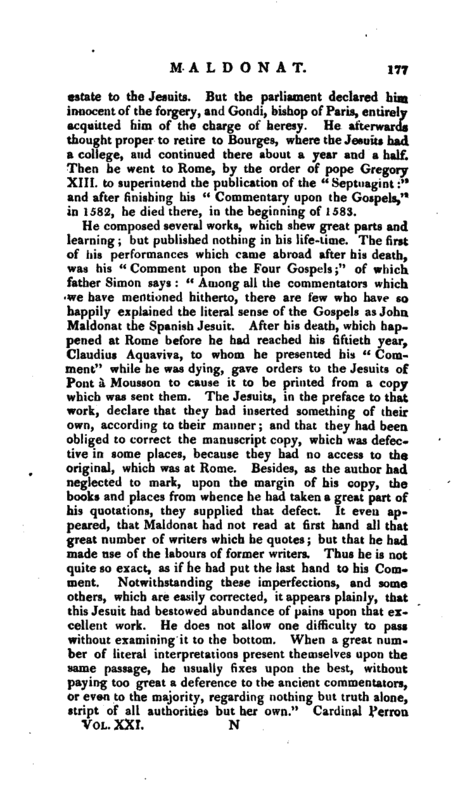 The first of his performances which came abroad after his death, was his “Comment upon the Four Gospels;” of which father Simon says: “Among all the commentators which we have mentioned hitherto, there are few who have so happily explained the literal sense of the Gospels as John, Maldonat the Spanish Jesuit. After his death, which happened at Rome before he had reached his fiftieth year, Claudius Aquaviva, to whom he presented his” Comment“while he was dying, gave orders to the Jesuits of Pont a Mousson to cause it to be printed from a copy which was sent them. The Jesuits, in the preface to that work, declare that they had inserted something of their own, according to their manner; and that they had been obliged to correct the manuscript copy, which was defective in some places, because they had no access to the original, which was at Rome. Besides, as the author had neglected to mark, upon the margin of his copy, the books and places from whence he had taken a great part of his quotations, they supplied that defect. It even appeared, that Maldonat had not read at first hand all that great number of writers which he quotes; but that he had made use of the labours of former writers. Thus he is not quite so exact, as if he had put the last hand to his Comment. Notwithstanding these imperfections, and some others, which are easily corrected, it appears plainly, that this Jesuit had bestowed abundance of pains upon that excellent work. He does not allow one difficulty to pass without examining it to the bottom. When a great number of literal interpretations present themselves upon the same passage, he usually fixes upon the best, without paying too great a deference to the ancient commentators*, or even to the majority, regarding nothing but truth alone, stript of all authorities but her own.” Cardinal Perron | laid, that he “was a very great man, and a true divine; that he had an excellent elocution as a speaker, understood the learned languages well, was deeply versed in scholastic divinity and theology, and that he had thoroughly read the fathers.” His character has been as high among the Protestants, for an interpreter of Scripture, as it was among the Papists. Matthew Pole, in the preface to the fourth volume of his “Synopsis Criticorum,” calls him a tvriter of great parts and learning. 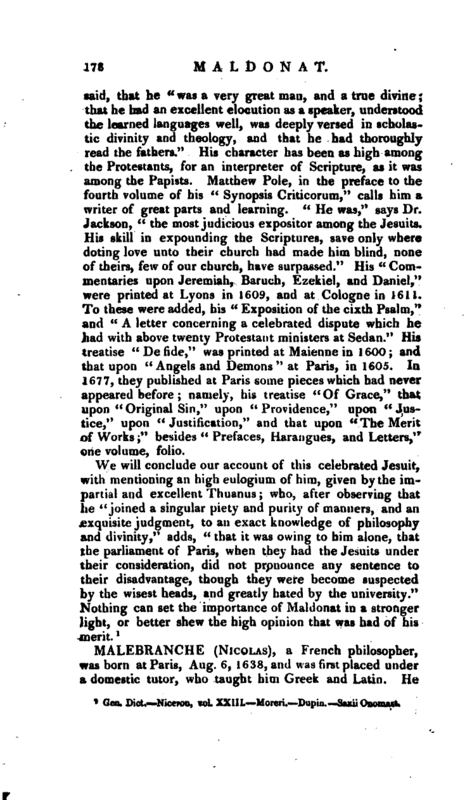 “He was,” says Dr. Jackson, “the most judicious expositor among the Jesuits. His skill in expounding the Scriptures, save only where doting love unto their church had made him blind, none of theirs, few of our church, have surpassed.” His “Commentaries upon Jeremiah, Baruch, Ezekiel, and Daniel,” were printed at Lyons in 1609, and at Cologne in 1611. To these were added, his “Exposition of the cixth Psalm,” and “A letter concerning a celebrated dispute which he had with above twenty Protestant ministers at Sedan.” His treatise “De fide,” was printed at Maienne in 1600; and that upon “Angels and Demons” at Paris, in 16O5. In 1677, they published at Paris some pieces which had never appeared before; namely, his treatise “Of Grace,” that upon “Original Sin,” upon “Providence,” upon “Justice,” upon “Justification,” and that upon “The Merit of Works;” besides “Prefaces, Harangues, and Letters,” one volume, folio. Gen. Dict. —Niceron, vol. XXIII. —Moreri, Dupin. —Saxii Onomast.